Looking to boost the love that’s present in your life? Maybe you’re striving for career success? Or maybe you’re searching for happiness? 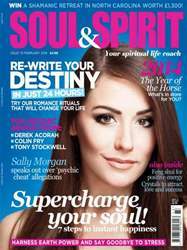 Whatever your spiritual goals and wishes, Soul & Spirit magazine is just the publication you need to help you on your journey to enlightenment. As a spiritual life-coaching magazine, Soul & Spirit magazine provides you with all the daily tips and tricks you need to ensure you’re getting the most out of your life and aligning your daily actions with your hopes and dreams. Covering a broad and varied range of interesting topics, such as crystals, angels and divination, each issue of Soul & Spirit magazine will leave you feeling refreshed and focused. If you need more light in your life, subscribe to Soul & Spirit magazine today and get every single issue delivered directly to your device before it hits the shops! Re-write your destiny in 24 hours! Psychic advice from Derek Acorah, Colin Fry and Tony Stockwell. Romance rituals that will change your life. Crystals to attract love & success. Win a shamanic retreat worth £1,300! Sally Morgan exclusive interview. Feng shui for positive energy. Use earth power to banish stress. What’s in store for the year of the horse? Soul & Spirit magazine is the perfect publication for anybody looking to boost their love, career, success or happiness. With insightful and engaging features on all aspects of spiritual life coaching. Inside every issue of Soul & Spirit magazine, expect to find helpful meditations to centre your soul and provide clarity alongside affirmations to help you be your best self. Enjoy yoga poses to try out at home to help you gain a deeper understanding of your body - always start your day on the right foot! You can also enjoy an exciting variety of competitions. Soul & Spirit magazine is the perfect monthly read for anybody looking to better themselves and bring prosperity to their own lives and the lives of others. Subscribe today and get every issue delivered directly to your device before it hits the shops. Coverage of a broad and interesting range of topics such as crystals, angels, divination and much more! You'll receive 12 issues during a 1 year Soul & Spirit magazine subscription. You'll receive 12 issues during a 1 year Soul & Spirit magazine print subscription.